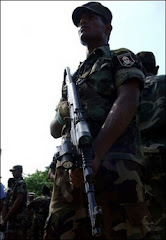 The Tamil daily "Athirady.com" which had been collecting the names of the peoples who were killed by the Liberations Tigers of Tamil Eelam (LTTE) during the past will finally publish its research material during this week, according to sources from Athirady. "We are collecting this lists of names to expose Prabhakara's and his organization's ruthless activities among the Tamil Community. We plan to complete details report and hand it over to the UN, EU, India and IC," according to a senior Athirady official. Furthermore, the athirady officials also requested the public to assist this project by sending any available data to them.